1. Firefly FR.Mk.5 Unit: 812 NAS, FAA No. 206/R HMS Glory, Korean coast, circa 1951. 2. Firefly FR.Mk.1 Unit: 827 NAS, FAA No. 273/P (PP 596) HMS Triumph, Task Force 77 (US Navy), Yellow Sea, July 1950. 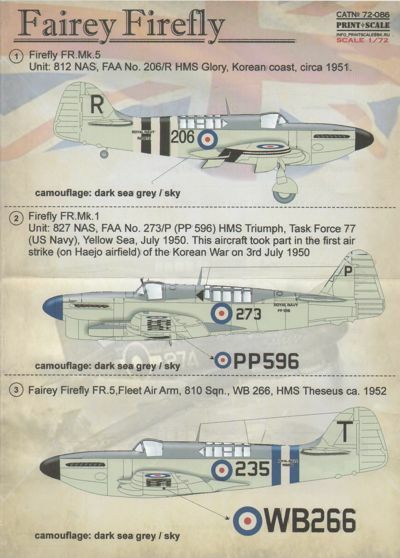 This aircraft took part in the first air strike (on Haejo airfield) of the Korean War on 3rd July 1950. 3. Fairey Firefly FR.5,Fleet Air Arm, 810 Sqn., WB 266, HMS Theseus ca. 1952. 4. Firefly TT.5 Wb271 (889) of 725 Squadron, Royal Australian Navy, New South Wales 1959. 5. Fairey Firefly Mk.l, Royal Thai Navy 1952. 6. Firefly F.Mk.I "Evelyn Tentions" Unit: 1771 NAS, FAA No. 275/N (DK431) Usual pilot: Sub-Lieutenant P.H.Dawton. HMS Implacable, British Pacific Fleet, March-April 1945. One notes red L on the landing gear door, reminiscence of the former code of the plane '4L'. The plane had been baptized 'Evelyn Tentions', a word game for the expression "evil intentions".